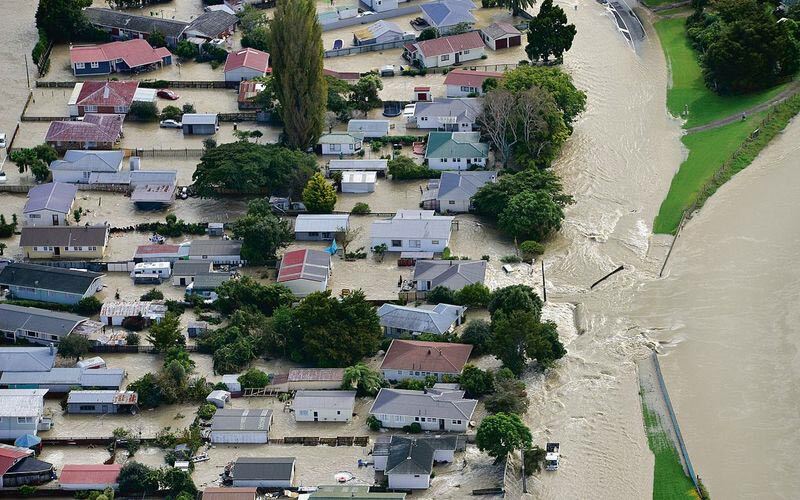 Floods are New Zealand’s number one hazard in terms of frequency, losses and declared civil defence emergencies. Floods damage property and can cause injury and loss of life, as well as contaminating water and land. Historically we associated flood risk with a small pocket of locations, but we are now observing floods throughout all of New Zealand. Recently local councils have become a lot more proactive in identifying problem areas that are at risk of flooding. Geo Mapping is being used to identify areas that are flood susceptible and at a risk of flooding. Generally areas will be identified as low, medium or high risk and will refer to the risk of flooding as a 1 in 100 year flood event or 1 in 50 year flood event. Flooding can be described as ponding, overland flow, and coastal inundation. Unfortunately there is no single standard – meaning data, reporting and risk management can vary from council to council. If you are purchasing a property in a coastal or low lying area become a private investigator for a day. It is not always enough to rely on the Real Estate Agent. A LIM report will identify if the area or property have been classified by the council as hazardous. The Certificate of Title will inform you if a Section 36, 73 or 74 of the Building Act has been issued. You can also go online and find the property on the local councils geo map and look for hazards. Alternatively you can visit or call the council to find out more information. If the property or area is known to flood or at risk of flooding ask neighbours and other locals about their experiences with previous flooding. This is especially important if you are new or unfamiliar with the area. It can also be beneficial knowing who the current owner has been insured with incase you do experience difficulties. It is more than likely that you will be able to get insurance. Unfortunately it wont always be with your first choice of providers. You do need to accept that insurance on your home in a flood prone area may cost more, or may have special terms and will likely have a higher flood excess. Typically you can expect to see the following endorsements added to your insurance. We will not pay for any costs of additional materials, work or expense required solely to comply with Government or local authority bylaws and regulations, if those costs are required solely to meet the requirement of Government or local authorities to reduce the exposure to a natural hazard at the home. An excess of $2,500 applies to any claim for water entering the Home as a result of flood, or inundation by seawater, replacing the excess shown in the schedule. 4. Has the risk been mitigated? Sometimes the flood risk has already been minimised. The home could have been built on high piles to avoid the flood water. Or the council may have spent millions on flood prevention. This type of information can be used to sway an insurer when it comes to offering you and your home cover. 5. Is the property at risk of other hazards? Flooding may not be the only issue. Check if the property is also at risk of erosion, landslip or subsidence. Homes in areas such as Clifton on the Hawke’s Bay coast and coastal towns like Tapu on the Coromandel Peninsula are at risk of floods, tsunami and erosion. Flood Risk is not only a coastal issue. Devastating floods have been caused by rainfall especially if that results in a river bursting its banks, like in Edgecumbe. The best way ensure you are getting the best terms is to present your insurer with all the facts. Failure to advise your insurer that your home is at risk of flooding can result in non disclosure. The worst case scenario is that your insurer will void your policy and your claim wont get paid. In the best case scenario your insurer will apply the terms / excess / premium to your policy that it would have applied had they known of the risk, and your claim will be paid. To have your insurance application considered by initio you will need to complete the linked Flood and Landslip Questionnaire and email to info@initio.co.nz along with any supporting documentation. We will then review your application and confirm if we can provide insurance on your home. If you have suffered a flood and are wanting advice on your claim, please refer to our helpful claim guide.